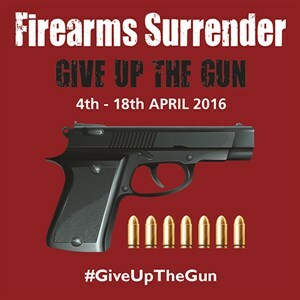 Today, Monday 4 April 2016, we (Lancashire Constabulary) and five other police forces from across the North West, are appealing for people to ‘Give up the Gun’ with a two week surrender of firearms and ammunition. It’s been around 18 months since we last asked members of the public to surrender unlawfully held or unwanted guns and ammunition to prevent them from getting into the wrong hands. A total of 103 guns including shotguns, air guns, pistols, rifles and revolvers were handed in along with 3,419 rounds of ammunition during the 2014 surrender, codenamed Operation Holster, and it is hoped that this year even more items will be handed in. Many firearms are held in innocence and ignorance of their illegality or are overlooked and forgotten in people’s homes. Others are acquired and distributed by criminal networks to harm, threaten and intimidate their local communities. The surrender gives the chance to dispose of the firearm or ammunition by simply taking it to a local police station and handing it in. The surrender will be held for two weeks from Monday 4 April at 8am to 8pm on Monday 18 April. Surrendering unwanted, unlicensed weapons avoids the risk of them becoming involved in criminality and means that members of the community can dispose of firearms in a safe place. During this two-week period, those surrendering firearms may not face prosecution for the illegal possession and can remain anonymous. However, each firearm handed in will be assessed by firearms officers, with some weapons being forensically checked for evidence. Chief Inspector Mark Baines said: “Following on from the success of the 2014 surrender, taking more than 100 firearms off our streets, this is another opportunity for people to do the right thing and get rid of these potentially deadly weapons. The message really is simple – give up the gun, help us save lives and keep our communities gun free. “Even though many firearms in Lancashire are legitimately licensed, we know that there are still many unlawfully held. These weapons may be a trophy or antique, acquired or inherited from a relative, or firearms and ammunition that have been forgotten about for many years. “We would encourage people to come forward during the two weeks and help us to stop these weapons from falling into the hands of criminals. Anyone handing in a firearm or ammunition during this opportunity is advised to check the opening times of their nearest station before they set off. Details can be found here. Anyone wishing to hand-in firearms should put them in a box or strong bag and put ammunition in a separate box or bag. Never attempt to take an uncovered weapon out in public. To receive further advice on how best to transport the weapon responsibly from home to the police station phone 101 before travelling. If you know of people involved in illegal firearms call Lancashire Police on 101 or Crimestoppers on 0800 555 111. Crimestoppers is offering a reward of up to £1,000 for information that leads to the recovery of a firearm and an arrest and conviction.